NASA has been developing the technology to 3D-print an entire rocket engine, and it recently tested a collection of parts already made. The successful rocket firing is a fiery proof of the future of this technology. When you think of 3D printing, you may think of the kind of small, robot-like plastic extruding devices that can churn out all sorts of trinkets on the desktop. These 3D printers are occasionally very useful—I’ve replaced a very odd-sized bath plug with a custom 3D printed one, for example. But 3D printing is also being pursued by serious manufacturers of all sorts of products, because this sort of “additive manufacturing”—to give it its proper name—can actually deliver some significant benefits. These include cost savings for custom manufacture of one-off devices in a number of different materials from ceramics to metals. Including rocket engines. 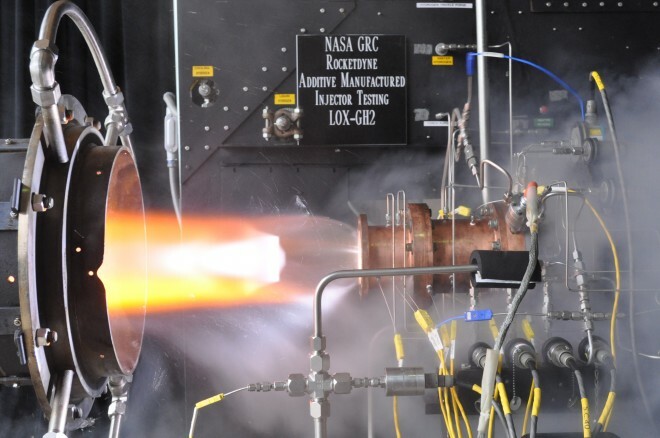 Even NASA is researching 3D printing for something that may surprise you: A rocket engine. 3D printing parts of a rocket engine has some serious advantages. Rocket engine components can be incredibly complex and they have to be made in amazingly precise shapes due to the high pressures and speeds they operate at. A flaw in a Russian-made engine, for example, is thought to have caused the recent crash of an Orbital Sciences rocket. But 3D-printed rocket parts, made well, can be produced without the need for welds or joins, and could even be designed to be more optimal for aerodynamics or fuel-flow. SpaceX, which just performed a historic landing of its Falcon 9 rocket, uses a few 3D-printed rocket parts in its Merlin rocket engines. Now NASA has completed several test runs of what it calls a 3D-printed “breadboard” engine—various components of a fully working rocket engine strung together in a rig that looks nothing like a real, flyable rocket engine. Some 75% of the parts of this engine were 3D printed, and it worked just fine, as NASA’s thunderous videos demonstrate.